Surfing is believed to have originated long ago in ancient Polynesia, and later thrived in Hawaii. Surfing is often referred to as the ‘sport of kings’, this is because surfing was originally reserved for alii, (Hawaiian royalty). However this taboo was abolished in 1819, and commoners were allowed to participate in the sport. However in the 1800’s Western Society arrived in Hawaii, and took control over their customs and traditions and tried to overthrow them, setting rules about Hawaiians religious beliefs, wearing more clothes, learning to read and write, working more, etc. 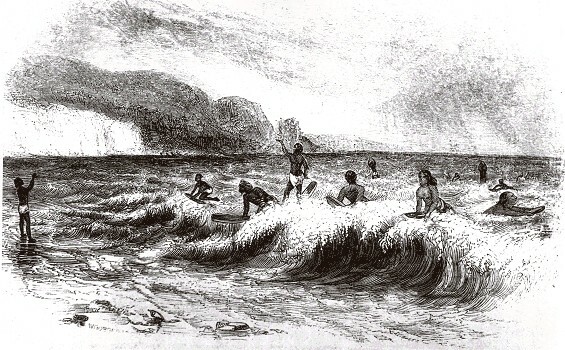 Hawaiians were also restricted and discouraged from play, including surfing. Some of these examples of the influence of a Western Society can still be seen today, for example, Christianity is the biggest and most common religion in Hawaii. However, despite their ancestors being discouraged from the sport, Hawaiians still love to participate in surfing, and thousands of tourists travel to Hawaii each year to witness, and participate in surfing the great waves of Hawaii themselves. This entry was posted in Journal and tagged hawaii, history, influence, origin, sunset, surf, surfing, taboo, wave, western, wood by sunsetwave. Bookmark the permalink.